Gosh, I didn't realise the time! It's been one of those days thats totally flown by without even realising it. I got my eyelash extensions done again today which I loooovee and finished up all my loose ends before going away on holiday. Im also somewhere near completely packed, I still need to sort out my hair products You can see my new hair a bit better in these photos as it's not as curly as I did it in the other photos from when I first showed it off. Still loving it though! Much softer, prettier colour! 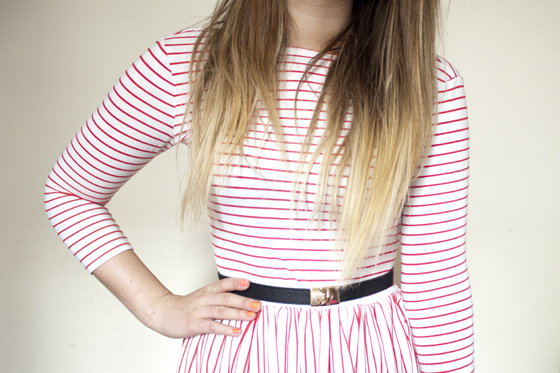 I just wore this simple striped red dress and a black belt with tights and my leather jacket. I bought this faux McQueen scarf from Primark to take away with me but thought I'd wear it today as I liked the *cringe alert* rock-y edge *cringe alert* it gave the outfit. It occurred to me recently I haven't been buying much from Primark as its way too hard to shop in ones in London. I didn't realise how lucky I was back home and going to the quiet large Primark in Telford! I now realise what people mean when they sat "I can't believe you got that in Primark, I never find anything"! I was wayyy too spoilt before! However I've picked up a few nice bits recently which Im sure once I return from my hols I'll be showing off! Such a super cute striped dress! Love the edge you added to the look with the jacket. It's been a long time since I've seen a dress I really, really love. telford primark is the best! i went in the oxford street one recently and left with nothing, wayyy to busy in there! I love the super-blonde ends of your hair. I've recently given up the ombre and gone back to blonde highlights. It feels great! I know what you mean about Primarks in London. The returns queue on Oxford Street was about 40 people long the other day. Not cool! Real life diary entries of a strange 90's teen.. and much more! I love your dress, you look amazing. Such a great look. Also really considering eyelash extensions myself, where do you get them done? I love this dress, and love your hair! Love this dress, and your hair is so beautiful! You totally make me want to try eyelash extensions - your eyes look lovely. And I'm digging the hair, as always. I'm a ginger, but maybe it's time for some ombre!! I love this dress every time you wear this. The scarf goes nice with it, it does give it that rocky edge haha! You can see your hair much better in these photos - love it! 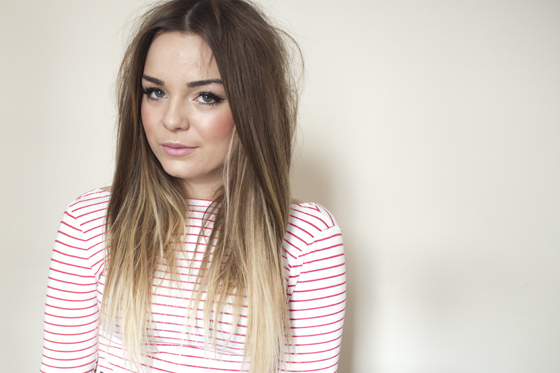 I love how light the ends of your hair are now, so nice for summer! The dress looks fab too! Why are you looking so beautiful? completely in love with this outfit! Oh I really love that dress! I love the miss-matching stripes! I'm holding a giveaway on my blog if you'd like to enter? Love how you've put this outfit together. Really simple but it works so well, big fan of the dress! Hair looks lovely too! cute dress! 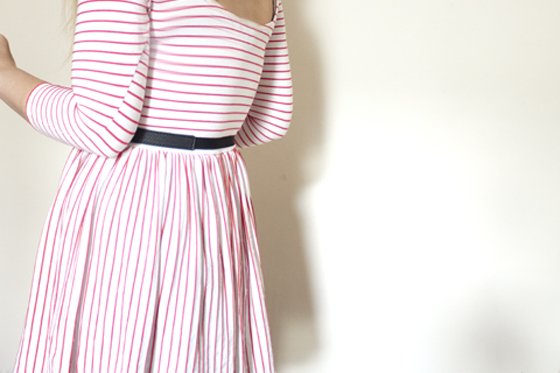 love how both vertical and horizontal stripes are featured on the dress, gorgeous! I looooove that dress! I'm obsessed with stripes :S I love the scarf too but I'd kill for a real McQueen one! Love that dress. Simple, but cuuuute. You gotta go to the weird obscure Primarks in the middle of a weekday, like Wood Green or Ealing Broadway. I've been to both of them during a weekday afternoon and they were super quiet! Oxford Street Primark has given me PTSD. I love your look! The leather jacket and scarf look so good with it also! 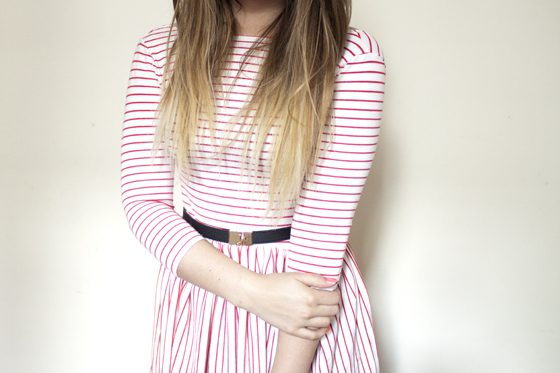 Such a cute dress, I love stripes! J'adore, j'adore, j'adore ♥ ! Tes cheveux et ta robe sont magnifiques, la veste et l'écharpe vont très bien avec aussi, tu es superbe ! Lovely dress and I love the scarf ! I love how natural your eyelash extensions are. Looking fab as always! I love the dress and your hair is looking wonderful after the dye! Much more summery. The Primark in Aberdeen can get so busy sometimes it's unreal - I dread to think what it's like in some of the major English cities! Love the dress and the hair. Awh Primark in telford is brilliant! I used to go there a lll the time, in fact i think it was the first time i ever went to primark! Love your scarf and jacket ! That dress is simply amazeballs with a leather!